They say the house always wins. Always. Is that actually true? After all, people wouldn't continue to play casino games if they always lost. But casinos exist to make money. They're not charities. That's why every casino game puts the house at an advantage. How much of an advantage depends on the type of game being played and, in some cases, the type of bet the player is making. So how does Roulette stack up? Is it one of the most generous games for players, keeping the house edge at a minimum? Or will you walk away feeling cheated by the casino, even if you netted a sweet win? Read on for everything you need to know. Are you ready to win more when playing roulette? Tired of seeing your bets collected by the croupier? We can tell you the secret to walking away a winner in three words: strategy, strategy, strategy. Don't keep watching your bankroll shrink. Read our strategy guide and learn about the many roulette systems out there. 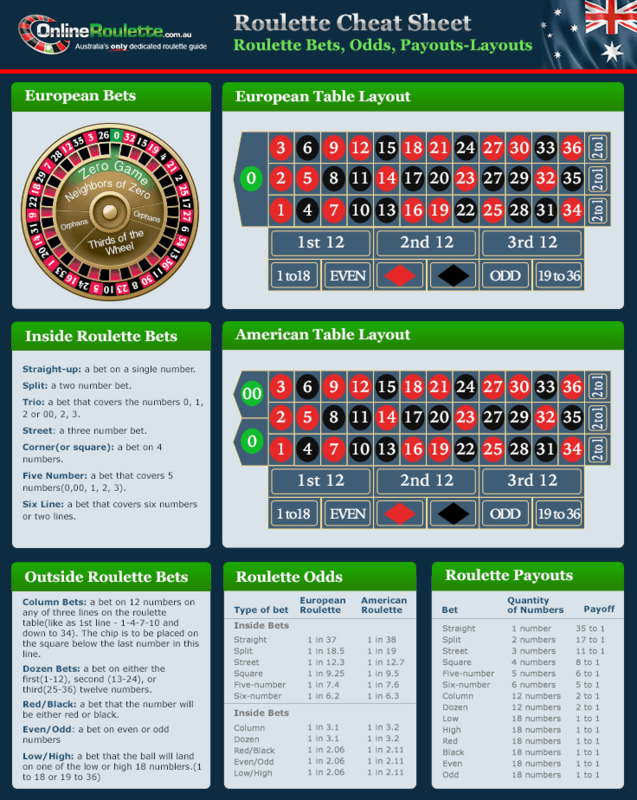 View a larger version of our roulette odds chart by clicking the image, and then download it and keep it for reference. To figure out the house edge, let's take a quick look at the inside. We're talking about the numbers on the inside of the Roulette board that includes 1 through 36, 0, and 00. Hitting any of these numbers pays out 35:1. That means if you bet $10, you'd win $350. But mathematically, you really have a 1 in 38 chance of hitting that number. Remember, there are 38 numbers on the board (in European Roulette, you'd have a 1 in 37 chance of hitting it). To see what we mean, let's suppose for a second that you were to bet $1 on every single number on the Roulette wheel. You're guaranteed to hit your number. There's absolutely no question. You've got $1 on the numbers 0, 00, and 1 through 36. So you've dropped $38 down on the board. No matter what number hits, you'd get paid $35. But you paid $38 to win that $35. So technically you're down $3. In a nutshell, there's a 1 in 38 chance that you'd win 35 times your bet. And at the same time, there's a 37/38 chance that you'd lose your bet. That $1 bet would net you $35, but really you should win $37 based on the 37:1 odds of hitting your number. Take the $2 difference and divide it by the 38 numbers on the Roulette wheel and you've got yourself a house edge of 5.26%. So how does this stack up to other casino games like Blackjack, Baccarat, and other popular games? Let's take a look. There are loads of possible bets in Craps, and the odds really fluctuate. You can find a house edge as low as 1.36% if you bet on Don't Pass or Don't Come. Or you can shoot all the way up to 16.67% if you bet Proposition 7. Way too many Casino War players sit down thinking they have a 50/50 shot at beating the house. After all, in a high-card win battle with little decision-making, how can the casino gain a big edge, right? Well, pretty easily. If you're foolish enough to bet on a tie, you're handing the casino a house edge of 18.65%. But suppose you don't bother betting on a tie. Does the casino still have an edge? Definitely. Because you have to go to war with the dealer on a tie, the house gains an edge of 2.88%. And if you decide to surrender? The house's edge climbs to 3.70%. Ever wonder why single deck Blackjack is so hard to find at casinos? It's not just because of card counters. It's also because of the house edge the casino has. The fewer the decks in the shoe, the lower the house edge is. In a one-deck shoe, the house has an advantage of just 0.17%. With eight decks, it climbs to 0.65%. This popular casino game is played by millions all over the world, but we're not exactly sure why. When they say Keno is a lot like playing the lottery, they aren't just talking about the fact that it's a numbers game. The odds also happen to be pretty horrible thanks to a huge house edge. We're talking a house edge of between 25% and 29%. Massive, really. As you can see, the house edge for Roulette falls somewhere in the middle. Not the lowest, but definitely not unreasonably high. And even with its house edge that might not be as good as some other games, it still pumps out tons of big winners. There's a reason why Roulette is one of the most popular casino games. Play if and discover why.